The Means Alumni Gym pays tribute to the pride and passion in the hearts of the Academy’s family and friends. Since opening in 1962, this building has served generations of students who have passed through its doors. 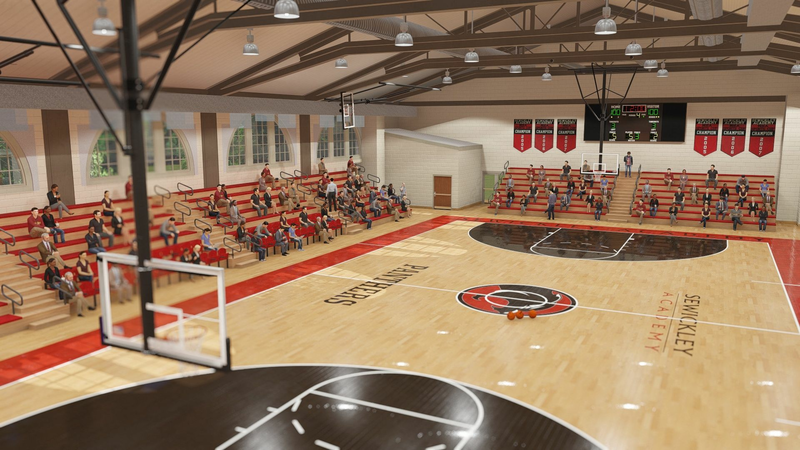 The historic transformation of a gym into a LEED certified multi-purpose center honors the tradition of advancing the school’s mission by thoughtfully responding to the needs of those it serves. The Events Center project is the centerpiece of our commitment to community. With Grades Pre-K through 12 on a single campus, it is important that our community can assemble under one roof. Our goal is to create an indoor space where students, parents, faculty, staff, and alumni can all gather together to celebrate important student milestones and Sewickley Academy traditions such as commencement, Founders’ Day, and our annual Day of Service. In addition, the space features flexible spaces that can be used for class meetings, special events, athletic competitions, training, testing, and more, making the facility a vital community hub. The number of students participating in athletics at the Academy has increased in recent years along with the number of sports programs and levels within each program. As a result, there is a need to enhance the space for physical education classes and provide safe team practice spaces for use throughout the year. The enhanced facilities serve not only the 85 percent of our students who participate in interscholastic athletics but also the remaining 15 percent, who benefit from additional health, wellness, and fitness programs made possible in this new space. “We have significantly expanded our athletic program over the past 10 years.